First brought into prominence in the West by Soviet research, Siberian ginseng has been routinely given to Russian cosmonauts to aid endurance in space. 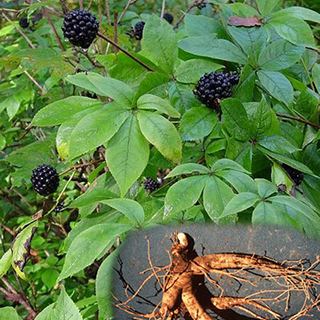 Similar to Korean ginseng, Siberian ginseng improves the ability to adapt to all kinds of stress, physical and mental. Everyday use - The adult standard dose is 1-2tsp (5-10ml) twice daily, diluted in water or fruit juice. When you re trying to resolve a situation rapidly, use a total of 4-8tsp (20-40ml) per day. This can be reduced to 1tsp (5ml) 3 times daily, a total of 3tsp (15ml) per day once the condition is calmer and symptoms are less severe. Long-term support is then the aim. Long-term use - Adults can take 1-2tsp (5-10ml) daily for 6-9 months and it will continue to exert its' beneficial effects for a few months after this point. It may be necessary to begin use again after a break, should stress levels remain high, perhaps over years rather than months. Resuming in this way is perfectly acceptable and can protect the body from long-term damage and stress. Siberian ginseng plants are often propagated from seed, although they can be slow to germinate and require six months of warm stratification followed by three months of cold. Seedlings can be planted 6 inches apart in late spring or early summer in almost any soil, including sand, loam, clay, acid, alkaline and poor soils. Siberian ginseng will grow in part shade to full sun and needs just enough water to keep soil moist. A balanced granular fertilizer, applied approximately 1/2 pound per shrub in early spring, will enhance growth and flowering. Autumn is the season during which harvesting of the roots occurs, these are dried and stored for the market.